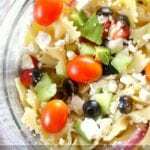 This is an easy and delicious Mediterranean pasta salad recipe to make as a side dish for a barbecue or a healthy lunch option with clean Greek flavors. 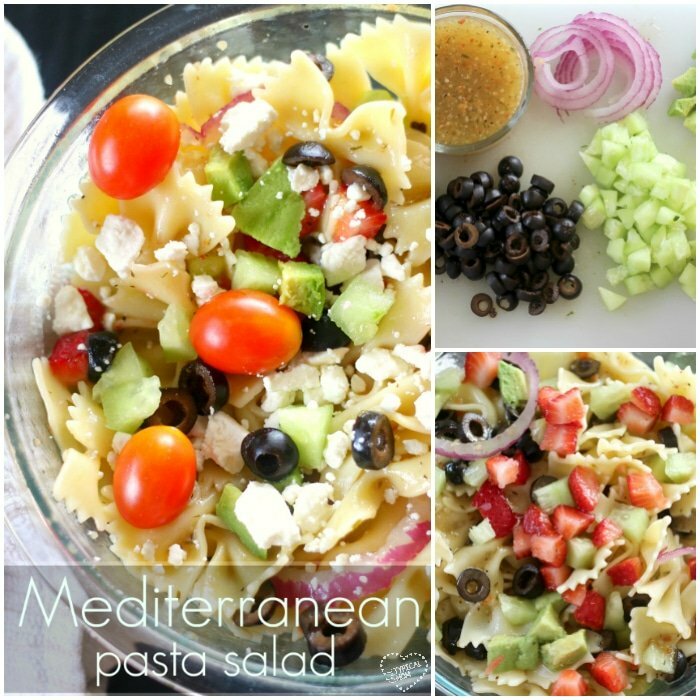 Looking for a healthy Mediterranean pasta salad recipe, well I have two to choose from! You just can’t meat the great flavors associated with Mediterranean food, and pair that with pasta and it makes for a great side dish, or even lunch! 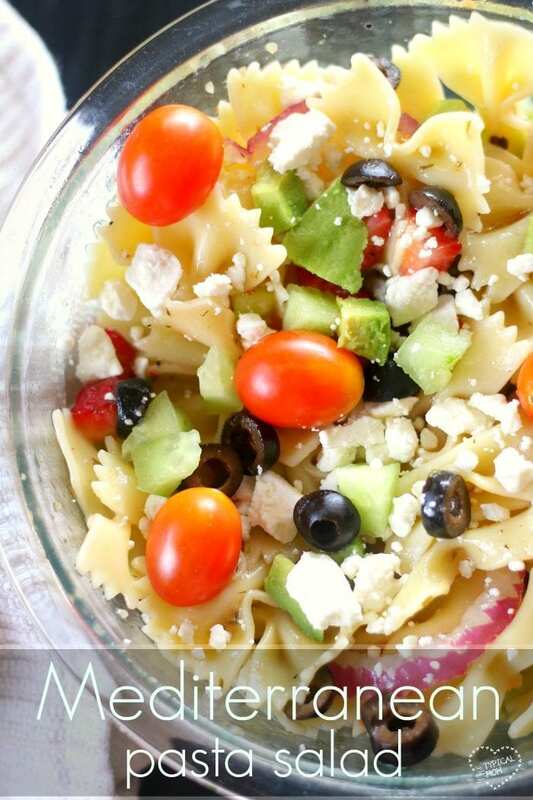 Here are two ways to make this great pasta salad. If you’re looking to incorporate more vegetables into your diet (aren’t we all) and keep your weight line trim these two recipes are great for that. You can even substitute lettuce for the bow tie pasta if you are trying to cut down on carbs. It’s very versatile, but the classic Mediterranean flavors are definitely there. This is what you need for this first pasta salad you see above. The fresh ingredients are the cherry tomatoes, cucumber and onion. Of course if you can find fresh olives more power to you but you may need to grab a jar of them at the store. Black are fine but if you can find a jar of Kalamata olives they’re even better! Incorporating veggies and fruits into your meals is always great in my opinion. 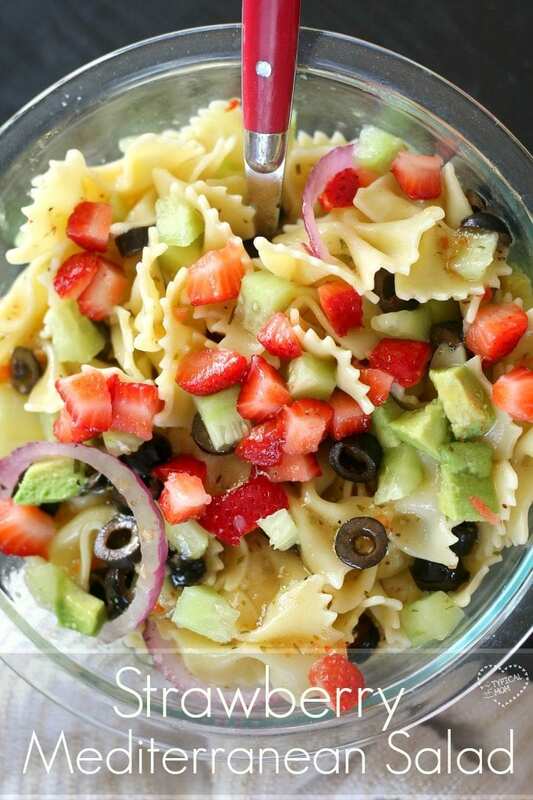 Add a handful of diced fresh strawberries if you choose which makes for a bit of sweetness to this Mediterranean pasta salad, but either way it is really tasty! Cook the pasta according to instructions on package, I like it a bit al dente, drain and place into a large serving bowl. Add all other ingredients after cutting into bite size pieces, mix well. Serve immediately, or place in fridge until ready to eat, great side dish for a BBQ or a few lunches! If you’ve never added fruit to a salad it really brings a bright and sweetness that is a great balance and you may be surprised at just how much you enjoy it. As a tasty lunch or a side dish for a potluck or barbecue with friends served in a pretty bowl that keeps it cool like this one, it is always a hit!